Here we have a great little Beaujolais from Louis Latour. We haven’t covered any of his wines yet on the blog but he’s a very well known negociant in Burgundy. This is a Beaujolais-Villages which means the grapes were selected from certain villages with higher quality than a regular Beaujolais. The result is a more full bodied and flavorful wine that will have more structure than a standard Beaujolais. Being a Beaujolais-Villages this will stand up to a medium meal nicely and you can pick one of these bottles up for about $15. We had it with sausage, peppers, and onions. colonelgrape: 92. This was the best bottle of Beaujolais I’ve ever had. That’s not saying a whole lot but I’ve had some bad ones in the past. It had a nice medium body with a deep garnet color. It tasted of red fruit with good acid and very mild tannins…fuller bodied than a regular Beaujolais. I would definitely recommend this bottle if you like Beaujolais…it’s a great wine to keep around for a night where you want wine but don’t want to break the bank. MobyGrape: 90*. I gave this one an astersisk for the record books not because of any potential steroid shenanigans that could taint its record, but quite frankly I didn’t write this review soon enough and forgot the finer points of this wine other than it was really good. I worked late this night and came home like a ravenous thirsty beast. Thankfully, the Colonel had sausage, peppers, and onions waiting for me with an open bottle of this puppy. I guzzled a couple glasses of it, and when I finally came up for air I realized it was really tasty, but I wasn’t quite sure what I actually tasted. I even had the rest the next day with the intention of paying attention but sure enough I saw the glass and *chug*, it was gone. Oops, I did it again. 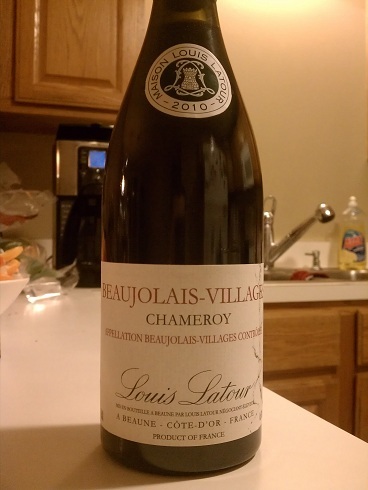 This entry was posted in Beaujolais, Burgundy, France, Gamay on January 6, 2013 by colonelgrape.